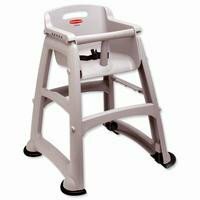 A full set of replacement feet for the Rubbermaid Sturdy Chair™ Child Seat. The Rubbermaid Surdy Chair™ Baby Seat with Microban® Antimicrobial protection makes safety and cleanliness a priority for your youngest guests. The Sturdy Chair™ Baby Seats contempory design incorporating Microban® technology makes it easier to clean than wood. The Microban® provides all over protection from bacteria growth that can cause odours and staining. The Newell Rubbermaid Sturdy Chair™ meets TUV and European safety standards. A stackable design makes for easy storage. When the optional tray is not attached the chair will fit under a standard table. Features a 3 point safety harness with one handed release.